Dave Sebesta is a long time resident on Moose Lake, northeast of Ely, Minnesota. He has many years of experience in canoe trip outfitting, and fishing the northwoods waters. He is an accomplished photographer and has spent years photographing the majesty of canoe country. Northwoods Memories is privileged to offer a few of Dave’s photographic works. We look forward to offering more of Dave’s photography in the future. Northwoods Memories is also partnering with Dave in developing some DVD motion features, which will be available in the near future. Dave Sebesta has created these four beautiful photographs for a set of eight note cards at $13.95 per set. Each card is 4 1/2 x 6 inches and includes an envelope. A set of eight cards is incluided in each attractive gift box. For your use, or as a gift! *Note that the title of the print on the image is only a watermark and will not appear on the actual prints. Dave's Northern Nights print of the northern lights, or aurora borealis, is a favorite. This 22"x 17" print, individually signed by Dave, is shipped in a "no-bend" shipping container to ensure it arrives ready to be framed. If, for some reason, you are not satisfied with the print, and choose to return it, it must be returned at your expense in the same or an equivalent "no-fold" shipping container. But our clients have been so pleased with the print that we are sure you will be as well. Note that the title of the print on the image is only a watermark and will not appear on the actual print. Dave's very popular "Northern Nights" photograph is also available in a standard 4" x 6" postcard. 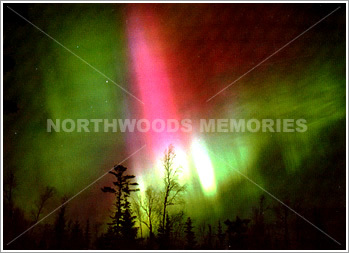 Send greetings with memories of the northwoods using this beautiful photograph of the northern lights. Note that the title of the print on the image is only a watermark and will not appear on the actual print.